Juana Bordas, author of two books, responds passionately to questions during an interview in the lobby of the Marriott Downtown at City Creek in Salt Lake City. 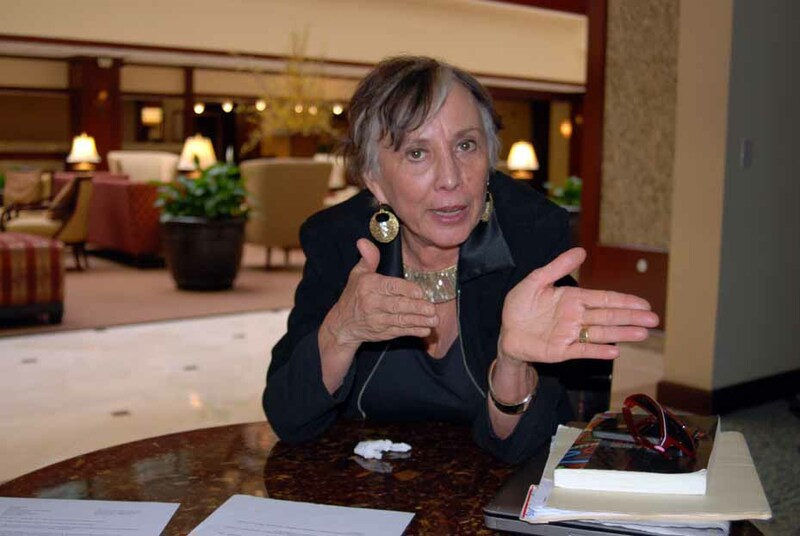 SALT LAKE CITY — Juana Bordas arrived in the spacious lobby of the Marriott Downtown at City Creek on a breeze, sat for a 25-minute interview, which was followed by a brief photo shoot. Then that same breeze that brought her in returned, announcing over the cell phone that her host is out front ready now to sweep her away again. Bordas had arrived at Salt Lake International Airport a little after 10 this Thursday morning, was briskly taken to the studios of Radio La Jefa, 1550 AM, for a live interview on “Pulso Latino,” preaching to the choir as it were. While in the studios of Radio La Jefa, Marcus Ortiz, an ABC 4 Utah reporter known for exciting, action-packed narratives, was on the scene interviewing Bordas. The lead to the story that ran on the late afternoon and evening news: “Latinos are no longer a burden but a political and economic force,” Ortiz begins tantalizing listeners in a style develop for radio but now describes pictures. “That’s the message a prominent Latina wants to pass on to the next generation of leaders,” he says. Bordas’ repertoire, as you will see, is one of extolling Latino accomplishments while projecting the impact of an emerging force — 50 million-plus — that she calls the “Latinization of America.” All this is known about her because the books came in the mail two weeks ago. Hispanics, for sure, are a plentiful source for needed leadership in the United States. In this moment, she takes a seat at a table near the Starbuck’. It’s just off from the lobby here in the Marriott. During introductions, she marvels at just having had lunch at The Roof Restaurant, which offers a high-up “breathtaking views of Temple Square and Downtown Salt Lake City.” It is said notably that Chef Pedro Mauricio creates international cuisine with daily buffet regulars and an array of choices on the menu. Over the years, Bordas has grown accustomed to the whirlwind that swept her in here. She is a regular presenter at workplaces, on college campuses and among community organizations across the United States. Bordas is a 20-20 witness to the dramatic changes that have swept across the nation since the Reagan administration. Did you know that Hispanics (designation created by the Census Bureau in 1980) in the U.S. come from 22 different Spanish-speaking nations in Central America, including Mexico in North America, and Europe? Ethnicity shapes Bordas’ worldview and not race. Bordas has an all-consuming life as president of Denver-based Mestiza Leadership International (MLI). She is the author of two books. Admittedly, she became an author because she kept hearing false assumptions about Latino people from higher-ups in corporate America. “The Power of Latino Leadership: Culture, Inclusion and Contribution,” her second book, clarifies matters while building on a historical framework. The book was released in April. Ortiz, in reporting for ABC 4-Utah, captured the essence of Bordas’ message for the next generation of leaders. More corroborative evidence is supported by her role with MLI, which, since 1995, has offered “training and organizational services that demonstrate the benefits of collaboration, diversity and effective leadership.” “Salsa, Soul, and Spirit” accompanied her forays into corporate America, where Latinos are becoming a known quantity and academia, which is in the midst of establishing new paradigms. “I think there are two that are really important,” says Bordas, who was emailed a list of questions several days in advance of this interview. “Besides the need to teach the history and culture, because our leadership grows out of those roots, right, the culture and history of our people. Beyond that, we have a very distinct model of leadership. “I like to call it leadership by the many,” she says, placing emphasis on ‘the many.’ I dedicated my book to the thousands of Latino leaders who are making such a great difference in their communities and in our country. Across every single state, every single city, we have thousands and thousands of leaders because our community model is bottom up, people working together. All we ever had was people. We didn’t have resources. We didn’t have influence. So our leaders have been very, very skilled at bringing people together, inspiring them and motivating them to collective action around uplifting their community. “It’s a servant model, but it’s not just me and you, but it is how do we serve our people? How do we serve a greater cause and a greater purpose? That is to understand our leadership and to understand how we have gotten to where we are,” Bordas says. Leadership by the many is the compelling reason of first importance in “The Power of Latino Leadership.” Then, knowing where you came from as Latino is of paramount importance among generations shaped by Diaspora. “The second purpose of the book is two help young Latinos to build on the traditions of their people, their ancestors, their ‘abuelos,’ which is their grandparents,” Bordas says. “It is to build on those traditions, to understand their history, and never forget where they came from. And also to understand that holding onto your culture makes you more powerful. Bigger questions like addressing poverty, improved educational attainment and the adverse affects of segregation are left to be answered tomorrow or at some point in the future. For now, one says destiny while the others says “destino,” presenting Bordas with the opportunity to expound on America, The Diversity Place. With the influx of people from Latin America, combined with native born, what is our combined destiny? Hispanic numbers are estimated around 50 million-plus. The last presidential election, Hispanic voted as a block, delivering 70 percent to President Obama. Among the 309 million actually counted in the last census and the estimate 11 million thought to be undocumented, what do the numbers mean? “We have an intergenerational look,” Bordas says. “That is important because the Millennial generation is the largest generation that has ever been on the planet — bigger than the Boomers. Forty percent of them are already people of color. Twenty percent are already Latino. Another five percent are identifying as multicultural. So where are we going if the largest generation, 45 percent of them, are identifying as nonwhite? “The Power of Latino Leadership” is available from Amazon.com. To place an order, go to the following link: http://poweroflatinoleadership.com. 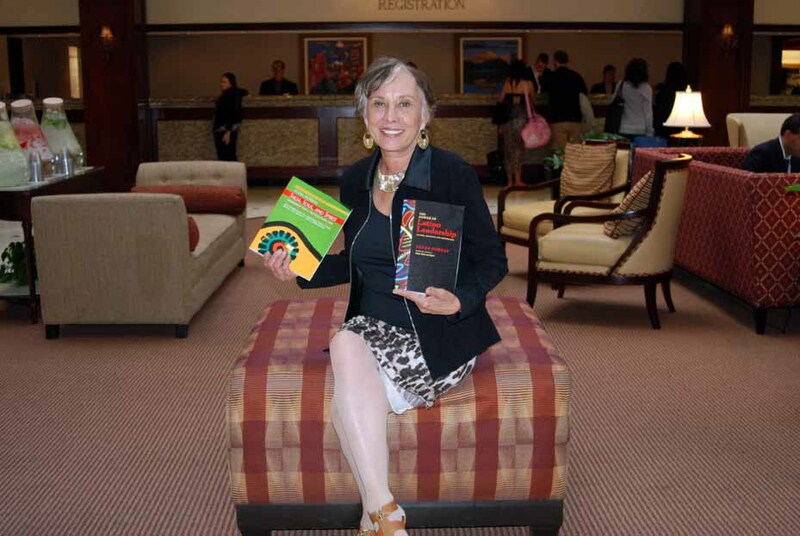 “Salsa, Soul, and Spirit” and “The Power of Latino Leadership,” both books written by Juana Bordas, reflect the author's commitment of 13 years research and writing.